There’s no doubt that your B2B company needs to implement an online marketing strategy, if it hasn’t already. B2B e-commerce is on track to pass $1 trillion by 2020, quadrupling the pace of B2C sales. B2B buyers are conducting research online and giving companies the opportunity to close more sales through digital channels. However, it has also been revealed that 83% of buyers are overwhelmed by the amount of content available online. Additionally, when they are conducting research, they are often multitasking and using a mobile device. This presents a problem for marketers who have a distracted audience with too much content to sort through. So the real question is, how do you get the attention of your B2B buyers? The secret is to use a carefully planned digital marketing strategy. With the right elements, you can cut through the noise and nurture relationships. This article will take a closer look at why reaching prospects is a challenge, and reveal four steps to help you optimize engagement. B2B buyers are increasingly making decisions online but are difficult to engage. Marketers can stand out from the crowd by executing a strategic digital marketing campaign. Four key steps to increase online engagement include providing the right content at the right time, creating a user-friendly experience, increasing visibility, and establishing social proof. B2B buyers are evolving. We have seen rapid growth in B2C online sales for years, but now B2B is set to catch up. One reason could be that millennials are moving into decision-making roles as baby boomers retire. Millennials were raised with technology and are more likely to research and shop online. Simultaneously, mobile tech is playing a role in advancing online shopping in terms of ease and accessibility. In fact, 78% of B2B companies predict mobile is the future of online commerce. With the rising number of B2B buyers online comes the increase in competition from other B2B marketers. To add to that, attention spans aren’t getting any longer, so buyers are more distracted than ever. If you don’t figure out how to stand out, you risk losing prospects to your competition. While a digital marketing campaign is multi-faceted, these four components are key to engaging your B2B audience. Two thirds of B2B buyers rely more on content now than they did in previous years. Many will move themselves about 90% of the way through the buying funnel before even contacting a vendor. In order to capitalize on this, you need to make sure buyers are seeing the right content at the right time. 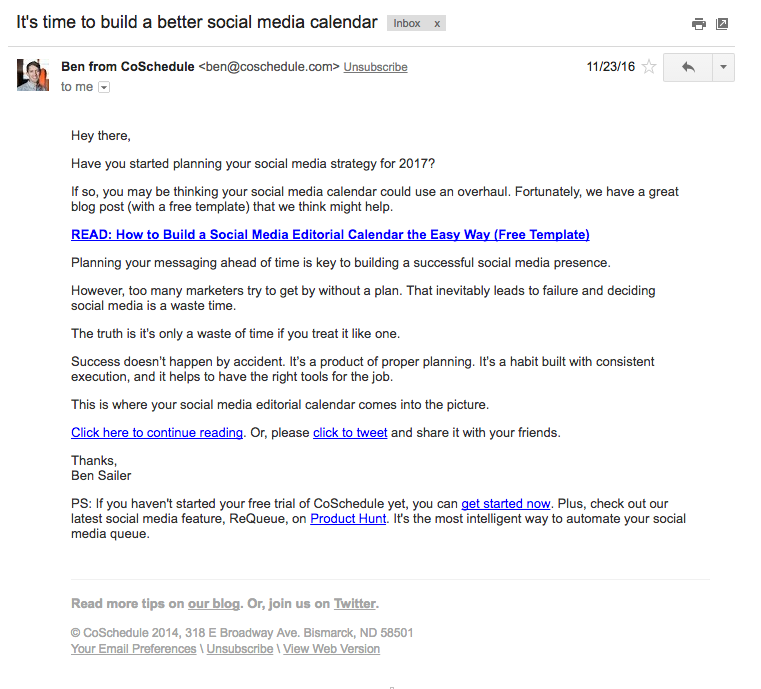 An example of timely content is the email below sent from CoSchedule during a free trial period. It promotes a free template and provides helpful links, encouraging the customer to make the most of the trial period. You can help your buyers navigate their way through the buying cycle by constructing a content strategy that caters to each step of the buying funnel, from awareness to decision time. Your content must be present on multiple channels in order to reach your buyers where they are looking. Aside from getting the timing right, it’s also important that you grab and hold your viewer’s attention. You can achieve this by utilizing the latest trending content formats such as visuals, storytelling, and infographics. A user-friendly website is one that is intuitive and doesn’t include elements that might annoy or frustrate the visitor. According to a 2015 UPS study, 72% of industrial buyers will shift to a different distributor based on the user-friendliness of their website. You can see that Zoho likely doesn’t have this issue. Its intuitive website features clear calls to action, simple navigation options, and minimal distractions. What can you do to make sure your website is user-friendly? First, it’s important to take note of what B2B buyers find most annoying. The 2015 B2B Web Usability Report uncovered the top reasons buyers leave a website, including no contact information, animated ads or popups, and poor design or navigation. Thankfully, there are lots of resources available to help B2Bs increase their user-friendliness. Relatively simple fixes such as optimizing the layout, creating an intuitive navigation menu, and improving page load times can make all the difference. Of course, in order to have the opportunity to engage your prospects, they have to see you in the first place. B2B buyers are present in various channels, with the vast majority utilizing both search engines and websites to conduct research. You can see from the number of HubSpot’s Instagram followers that the company is definitely nailing social media visibility. Establishment of a presence on at least one social media platform. Keyword research and content planning for your blog. Paid ads and SEO tactics to rank well in search results. Conversion Rate Optimization (CRO) for your website. A strategy to get customers to leave reviews. Email marketing campaigns to connect with subscribers. Mobile marketing to reach your audience on the go. In this world of omnichannel marketing, combining multiple components will increase your chance of being seen by buyers. Social proof refers to people’s reliance on the opinions of others to help make choices. Note how Zoho shares video testimonials on the home page of its website as part of a social proof strategy. Prospective buyers want reassurance to validate their decisions. A 2014 IDC study of B2B buyers found that three out of four use social media to engage with peers about buying decisions. Further, word of mouth recommendations from peers influence over 90% of B2B buying decisions! Buyers want to hear what others think of your products, and the more positive feedback they hear, the better. Expert social proof: Having a credible source endorse you, such as an industry influencer or a celebrity, is considered expert social proof. User social proof: This includes reviews, testimonials, case studies, and user generated content. Wisdom of the crowd: If you have the approval of a large number of past customers, others will infer that the masses must be right. Recommendations from friends: Your customers might share your service with friends and family providing direct referrals. You can learn more about how to use each of these types of social proof in this in-depth guide. B2B buyers are increasingly online, but arguably harder to reach than ever. Fortunately, you can cut through the noise and achieve the results you desire with a strategic digital marketing plan. Do you have any questions about optimizing engagement from your B2B audience? Let us know in the comments section below!